That's what I'm talking about. It might not look like a huge pile of juicy piggy meat on this baby, but it is. The compressed, crunchy goodness of panini bread shrinks the size of the sandwich and plays tricks on your eyes. This is actually gigantic, two great big slabs of country bread grilled to crisp, buttery perfection. It's easily the size of two sandwiches, and great for sharing. 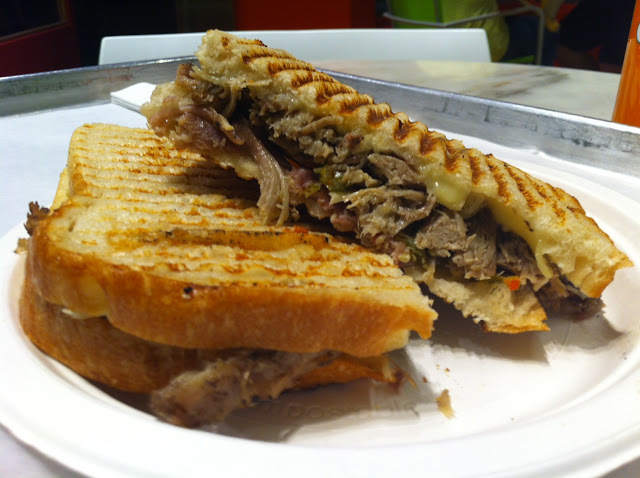 Packed inside is a simple, lovely mountain of roasted pork, a thin layer of sharp coppa, a thicker layer of melted fontina cheese, and tangy, vinegary pepper relish. This sandwich is actually too good; you can't eat it all because it's too rich and succulent. Another superb offering from 'Wichcraft.